Location: The chief port of Gondor, on the Great River in Lebennin above the Mouths of Anduin, at the confluence of the River Sirith; the junction of the South Road from Minas Tirith to the southern fiefdoms of Gondor and the road to the Crossings of Poros and thence to Harad. 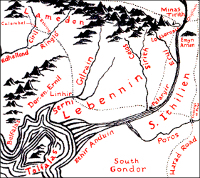 Lebennin and its environs, showing Pelargir on the Anduin at the confluence of Sirith. Long before in the days of their power the mariners of Númenor had established a haven and strong places about the mouths of Anduin, in despite of Sauron in the Black Land that lay nigh upon the east. Swiftly then [Legolas] told of... the dark tryst at Erech, and the great ride thence, ninety leagues 1 and three, 2 to Pelargir on Anduin. 'Four days and nights, and on into a fifth, we rode from the Black Stone,' he said. Pelargir is built. It becomes the chief haven of the Faithful Númenóreans. In the years of their power the Númenóreans had maintained many forts and havens upon the western coasts of Middle-earth for the help of their ships; and one of the chief of these was at Pelargir near the Mouths of Anduin. There Adûnaic was spoken, and mingled with many words of the languages of lesser men it became a Common Speech that spread thence along the coasts among all that had dealings with Westernesse. [The shores of Middle-earth] were much changed in the tumult of the winds and seas that followed the Downfall; for in some places the sea rode in upon the land, and in others it piled up new coasts.... [The] Bay of Belfalas was much filled at the east and south, so that Pelargir which had been only a few miles from the sea was left far inland, and Anduin carved a new path by many mouths to the Bay. In the later days to this haven came only the Faithful of Númenor, and many therefore of the folk of the coastlands in that region were in whole or in part akin to the Elf-friends and the people of Elendil, and they welcomed his sons. Eärnil I, his nephew, who succeeded him, repaired the ancient haven of Pelargir, and built a great navy. [Owing] to the vigour of the 'Ship-kings'..., Gondor reached the height of its power. This was Castamir.... He... had the greatest following of all the rebels; for he was the Captain of Ships, and was supported by the people of the coasts and of the great havens of Pelargir and Umbar. Castamir... was a cruel man.... [In] Minas Anor and in Ithilien... love for Castamir was further lessened when it became seen that he cared little for the land, and thought only of the fleets, and purposed to remove the king's seat to Pelargir. Thus he had been king only ten years, when Eldacar... came with a great army out of the north.... There was a great battle in Lebennin at the Crossings of Erui...; but Castamir's sons escaped, and with others of their kin and many people of the fleets they held out long at Pelargir. When they had gathered there all the force that they could... they sailed away, and established themselves at Umbar.... Umbar remained at war with Gondor for many lives of men, a threat to its coastlands and to all traffic on the sea. At last [Thorongil] got leave of the Steward and gathered a small fleet, and he came to Umbar unlooked-for by night, and there burned a great part of the ships of the Corsairs.... But when they came back to Pelargir..., he would not return to Minas Tirith, where great honour awaited him. 'There at Pelargir lay the main fleet of Umbar, fifty great ships and smaller vessels beyond count.... [Some] of the ships had put off, seeking to escape down the River...; and many of the smaller craft were ablaze. But the Haradrim... turned at bay, and they were fierce in despair; and they laughed when they looked on us, for they were a great army still. 'But Aragorn halted and cried...: "Now come! By the Black Stone I call you!" And suddenly the Shadow Host... came up like a grey tide, sweeping all away before it.... Pale swords were drawn; but... the Dead needed no longer any weapon but fear. None would withstand them. '"Hear now the words of the Heir of Isildur! Your oath is fulfilled.... Depart and be at rest!" 2 '[It] is, I reckoned, some 60 leagues as birds fly from Erech, over Tarlang's Neck into Lamedon, and so, crossing Kiril 3 and Ringló, to Linhir beside the waters of Gilrain, where there are fords that lead into Lebennin. 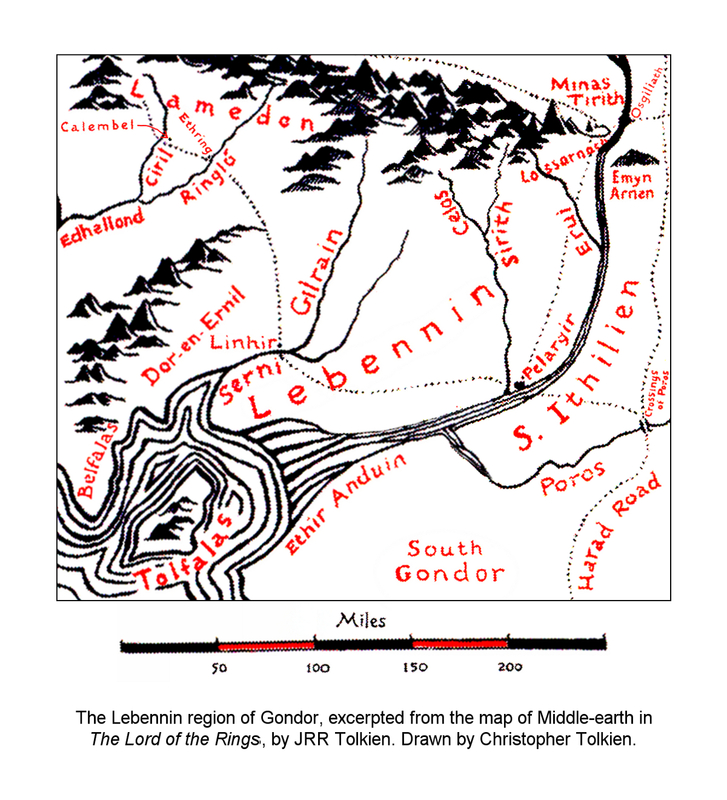 And from Linhir it is a hundred miles... to Pelargir on Anduin. 3 This text is from one of Tolkien's early drafts; the name is an earlier version of the proper name as published in The Lord of the Rings.